Central banks are printing rules almost as fast as they’re printing money. The consequences of these fast-multiplying directives — complicated, long-winded, and sometimes self-contradictory — is one topic at hand. Manipulated interest rates is a second. Distortion and mispricing of stocks, bonds, and currencies is a third. Skipping to the conclusion of this essay, Grant’s is worried. “One would not think at first sight that government had much to do with the trade of banking,” Walter Bagehot, the famed Victorian writer on finance, mused a century and a half ago. As time rolls on and regulation gives way to regimentation, the question presents itself: Do bankers have much to do with the trade of banking anymore? One sees a certain measure of justice in the humbling of the regulated financial titans who put themselves in this position of vulnerability; many of them were going broke. Then, again, there’s irony in the regulatees ceding power to the regulators. The latter seemed to know even less about the corrupted structure of money and credit than the former. The US Fed keeps talking about raising interest rates, and maybe the time has come, or will come in this lifetime, for the Federal Open Market Committee (FOMC) to act. Even the talk, though, places the Fed many cyclical furlongs ahead of its foreign counterparts. The central banks of Japan and Europe haven’t begun to acknowledge the eventual need for tighter money. Besides quantitative easing (QE) of one kind or another, Haruhiko Kuroda and Mario Draghi are dropping broad hints about the desirability of cheapening their respective currencies. Concerning the Swissie, the Swiss National Bank is reiterating its determination to print them up by the boxcar-full to protect the domestic Swiss economy against an export-thwarting Swiss/euro exchange rate. What the mandarins share — ours and theirs — is faith in radical nostrums. Few would have contemplated these measures, let alone espoused them, much less implemented them, before 2008. The conventional monetary belief system changed in the blink of an eye. In 2002, in a speech in Washington, DC, then Fed Governor Ben S. Bernanke invoked Milton Friedman’s idea for emergency monetary stimulus. When banks are impaired and the price level sags, the stewards of a fiat currency could hire pilots and deliver their stimulus by air instead of by land, Bernanke observed. Hence the phrase “helicopter money.” Wall Street, bemusedly reading the transcript of Bernanke’s speech, dubbed the future chairman of the Federal Reserve “Helicopter Ben.” It seemed funny. The Council on Foreign Relations lent its imprimatur to the concept of helicopter money in the September/October number of Foreign Affairs (Grant’s, 5 September). Martin Wolf, columnist at the Financial Times (FT), does the same in his new book, The Shifts and the Shocks. You think you know what Wolf is going to say — he rarely surprises in the FT — but here he throws a curve ball. Murray Rothbard, the great capitalist, long ago made the case against fractional reserve banking. No need to run for your money in a Rothbard-approved banking system; it would never have left the vault. Wolf echoes the call for 100% reserve requirements. Source: Federal Reserve (click image to expand). The argument has its appeal. The semi-socialized, thoroughly cartel-ized big banks keep stepping on the same rake. QE chiefly benefits the rich because it acts through banking channels to boost asset prices. And then QE boosts them some more. By and by, there’s another crisis. Thinking you know Wolf, you wait for him to urge an even more draconian regulatory system than the one in place. He doesn’t. Big Regulation is a failure, he allows, though not for lack of regulatory effort. In the wake of the Great Depression came the Glass–Steagall Act; it ran to 37 pages. “This time,” as he relates, “the Dodd–Frank Act ran to 848 pages and requires almost 400 pieces of detailed rule making by regulatory agencies. The total response may amount to 30,000 pages of rule making. Europe’s rule making will almost certainly be bigger still.” If the goal — always and everywhere — is to keep it simple, complexity is poison. Debt free? Here we come to the crux of the matter. Even the 21st century paper dollar pays some small homage to classical methods. On the Fed’s balance sheet, notes and bonds “secure” greenbacks and deposits. You can’t convert a wad of dollars into Treasuries or mortgage-backed securities (MBS), but the assets do — in a formal bookkeeping sense — anchor the liabilities. A note is a promise to pay; it is a debt instrument. The bills in your wallet, you US readers, are Federal Reserve “notes.” The nomenclature is a kind of echo, a tip of the hat to the distant days of gold convertibility. Under the Wolf plan, the newly printed dollars would be secured (or backed or mirrored) by no asset. The Wolfian dollar, pound, or euro would be the purest kind of scrip, a wolf in wolf’s clothing. Let us say, as we happen to believe, that ultra-low interest rates do not stimulate enterprise but rather depress it. If so, the European Central Bank’s embrace of a kind of QE (the asset-backed securities purchase program outlined several weeks ago) will prove worse than unsuccessful. Failing to stimulate, it will call forth new, still more counterproductive measures. Some will retort that the Fed has not failed but grandly succeeded — neutralized the “worst financial crisis in history” (as Bernanke now characterizes 2008), nourished a sickly banking system back to health, gilded the asset-holding portion of the community, and, by ignoring the naysayers, patched together a serviceable business recovery. The apologists are too modest. If they’re right, the Fed has more than succeeded. It has made monetary policy history. A survey of Forty Centuries of Wage and Price Controls, by Robert L. Schuettinger and Eamonn F. Butler, concluded thus: “In all times and in all places [governmental attempts to control wages and prices] have invariably failed to achieve their announced purposes.” Interest rates are prices. Does the Fed not “control” them? It smothers them through open-market operations and influences them by speech-making. It talks up “risk assets” in general. The sum total of these policies constitute control, or attempted control, with attendant financial (and ultimately economic) distortions. We continue to take shelter from the failure of post-crisis monetary improvisation. Source: Bloomberg, Federal Reserve (click to expand). “Control no prices” is a macroeconomic commandment. “Keep it simple, stupid” (KISS) is a law of living. The Fed and its regulatory counterparts flout them both. As for KISS, banking regulation is becoming complex enough to foil not only the regulatees but also the regulators. Let us say that you, gentle reader, are Janet Yellen. You are the most empathetic chair in Fed history. You are a believer in the efficacy of post-crisis — that is, radical — methods. You want higher asset prices to induce the promised results of the so-called wealth effect. You want higher consumer prices to forestall “deflation.” You want stronger business activity to energize the labor market. And as much as you desire even faster rising wages and a higher labor force participation rate, you want a solvent banking system. Once upon a time, the funds rate alone did the policymaking trick. Now the Fed fixes, or administers, three money-market policy rates. Interest paid on excess reserves (IOER) is the first. The reverse repo rate (RRP) is the second. The good, old-fashioned funds rate, or interest on borrowings in the federal funds market, is the third. Readers who have been away for a while will hardly believe how much things have changed. To tighten monetary policy was once a snap. In receipt of the appropriate instructions, the Federal Reserve Bank of New York sold Treasury bills to its chosen network of primary dealers. The sales drained cash from the banking system, thereby reducing the volume of excess reserves. By reducing the marginal supply of liquidity, the Fed increased the marginal cost of liquidity. Up went the funds rate. QE has steamrolled the funds rate and marginalized the funds market. Excess reserves stood at $1.8 billion when the Fed started to crank up its emergency purchases of Treasuries, mortgages, and kitchen sinks in the waning days of 2007; now such balances weigh in at $2.7 trillion. Not only is the federal funds rate low, but it also is increasingly irrelevant. “Bills only” was the name of the doctrine by which the Fed operated exclusively at the short end of the yield curve — the idea was to minimize disruption in the pricing of longer-term securities. “Bonds only” is virtually the Fed’s modus operandi today. Out of a $4.2 trillion securities portfolio, the Fed owns just $9.8 billion of T-bills; 56% of its holdings are locked up in issues maturing in 10 years or more. The very purpose of the Fed’s immense post-crisis intervention has been to disrupt the normal pricing of longer dated securities — to promote higher house prices through lower interest rates. Question: Without T-bills to sell, how could the Fed lift the funds rate, assuming it ever wanted to? The techniques under consideration are still in beta testing. 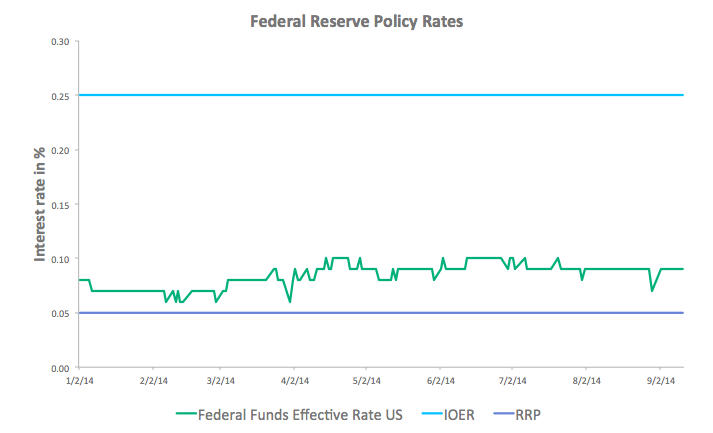 The Fed might raise the IOER, now fixed at 25 bps. But the IOER does not by itself set the floor in rates. We know that for a fact because the funds rate is quoted at just 9 bps. Federal funds are trading at a discount to the IOER for reasons that you certainly would not care to explore in detail. The short of it is that Fannie Mae and Freddie Mac are heavy lenders of federal funds. Foreign-chartered banks (regulatory advantaged in ways that you may also not care to explore in full) are heavy borrowers. The foreign banks deposit these balances at the Fed to earn the 25 bp IOER. The risk-free arbitrage gift comes courtesy of the taxpayers; of the $2.6 trillion in total reserves in existence on 30 June, $1.1 trillion, or 40% of the total, was credited to the US branches of foreign banks. Wait till the Tea Party finds out. The aforementioned RRP pays 5 bps, but neither does it constitute a dependable lever for rate-raising. Where the RRP came from, what it does, what it means, and what risks it poses are subjects covered in the 2 May issue of Grant’s. Suffice it to say that QE has brought about a redistribution of cash and securities. The Fed, buying everything in sight, has accumulated securities. The banks and the money funds, selling to the Fed, have reciprocally accumulated cash. From time to time, the money funds especially seek to borrow securities; accommodating them, the Fed lends collateral for cash. In this exchange of paper, the funds earn their 5 bps, lest they actually starve to death. Stock jockeys, unfamiliar with money-market lingo and not dying to learn it, may now be holding their heads in their hands. To them we say, “Courage!” As it paid to invest the time to get up to speed on the rudiments of subprime mortgages in 2007, so it will pay to become conversant with the basics of money and of central banking operations in 2014. With apologies to Hyman Minsky, this is a monetary moment. It will be a learning experience for all of us. The close of the gold era gave the Fed a freer hand at propagating money and jiggling interest rates — the right to exchange dollar bills for the Treasury’s gold at a fixed rate was a major inhibitor of monetary policy creativity. But even now, in the age of QE, the policymakers work under some constraints. One of these fetters is the Fed’s own post-crisis rule-making. Last month, Bloomberg reported that Citibank, in a new report, conveys the message: “Don’t Hate Credit, Just Use Leverage for 10% Returns.” Even if Citi were prepared to put post-2007 events out of mind, not everybody is. The Fed surely isn’t. The central bank is pushing hard to limit the banks’ reliance on short-term borrowing. There ain’t no such thing as a free lunch, of course. The Bank of Yellen may choose to throw a bone to the fund industry by expanding the RRP, the facility by which the money funds exchange their cash for the Fed’s securities to earn those pre-tax 5 bps. But this too would introduce complications. As many have pointed out — President William C. Dudley of the New York Fed among them — an expanded RRP facility could prove a money magnet in the next crisis. There would be few more inviting places to run, during a run, than to the Fed itself. To counter the potential disintermediating effects of the RRP, the Fed is, as previously reported in these pages, weighing a companion repo rate (Grant’s, 2 May). The head spins. Liquidity is another top item on the banking regulatory docket. The Fed wants the big dumb banks (BDBs) to hold enough “high-quality, liquid assets” to tide them over a 30-day funding disruption. According to published estimates, the BDBs are $100 billion short of the $2.5 trillion in Treasuries and other easily marketable securities they are meant to stockpile. At the margin, the new liquidity requirements — by boosting the demand for short-dated instruments — would tend to push down money-market yields, even as the Fed, hypothetically, was trying to raise the yield on those instruments. “I can’t tell you yet how we will do it,” said Dudley in a 20 May speech, “but I am fully confident that we have the necessary tools to control the level of short-term rates and the credit creation process.” Count us as nonbelievers. As QE1 came to a close, they claimed there would be no more QE. As QE2 came to a close, they claimed there would be no more QE. They claimed Operation Twist would end on 30 September 2012, only to extend it. Calendar guidance was offered and abandoned. Forward guidance was offered and largely abandoned. Economic thresholds (6.5% unemployment and 2% inflation) were offered as guideposts and largely abandoned. “Forecasting” is a word that clothes the art of educated guessing with a measure of scientific dignity. Concerning the nearby future, we guess that the Bank of Yellen will stumble over its very own policies. The interest rates it has imposed will prove to be the wrong rates — too low, we expect. Its regulatory policies will prove a stumbling block to the timely normalization of interest rates. So, befuddled by complexity, Yellen, et al., will bungle their zero-percent-interest-rate exit strategy. Another guess: The next financial crisis will be exacerbated, not ameliorated, by the very same policies. With money market interest rates still under government control near the “zero bound,” the Fed would lack a rate to cut when the time again comes to cut. And if a Countrywide or a Merrill Lynch got into trouble again, to whom could the feds turn to perform the patriotic favor of absorbing the failing firms into a stronger balance sheet? Probably not Bank of America, which, as John Plender recently noted in the Financial Times, has already paid $16.7 billion in fines, or tribute, for trying to do its bit in 2008. Needing to do something, the Fed would do just about anything. Helicopter money? It’s no longer inconceivable. The idea is becoming respectable. James Grant is the editor of Grant’s Interest Rate Observer, which he founded in 1983. Great article. FED has manipulated for about 5 years the risk transmission mechanism of US economy via an artificially low FFR as well as QEs. In the end, there will be no smooth transition to a normal monetary policy and financial markets will take a hit sooner or later. With or without a fiscal adjustment that US is desperatelly in need, the impact of returning to normal may well drag all world economy to recession. No easy way out this mess. Refreshing stuff. At least someone is prepared to bell this cat and not shy about highlighting the immorality and incompetence of the monetary imperialists running the Ponzi scheme of FIAT currency world. The ‘Population Explosion’ is proving to be EXTREMELY expensive ! By “companion repo rate”, are you referring to the fixed -rate, full-allotment overnight repo rate? I am a “stock jockey”, and I have no access to your 2May issues. 1. Milton Friedman preached stable monetary growth, not helicopters. He used the analogy to help us understand money. 2. Given the size of the Fed’s balance sheet, we could eliminate fractional banking. 4. Unfortunately, the future is dim because to support QE we have borrowed today economic growth that would have accrued to future years.